Fourth Row Center: Film Writings by Jason Bailey: On DVD: "Willy Wonka and the Chocolate Factory"
On DVD: "Willy Wonka and the Chocolate Factory"
Mel Stuart’s Willy Wonka & the Chocolate Factory is a movie that people of my age tend to hold an unwavering affection for; smart, funny, imaginative, and a little creepy, it’s a picture that holds up to the repeat viewing that any decent family film is invariably subjected to. Personally, I had more than one occasion where I watched it clear through, shrugged, hit rewind, and started it again (I’ll hasten to add that, at ten years old, my video library hadn’t quite bulked up yet). When you’re introduced to a film this beloved at that age, you don’t think about how it came to be, or examine it with much of a critical eye. It just is, a thing that exists, and it’s marvelous. But it is a film that I’ve revisited through the years, most recently its sleek new Blu-ray release, and as the critical eye develops, the movie’s little flaws begin to show. This is not unusual; even the most beloved films can start to crack if you get old and grouchy and jaded enough. But none of my minor nitpicks—which I’ll get to presently—can negate the considerable warmth and magic of this particular picture. But then news breaks that some will go in. Wonka has put out five “golden tickets” in Wonka bars, and the five lucky recipients (and one relative of each) will be allowed to come in to the Wonka factory for a tour, which will conclude with the gift of a lifetime supply of chocolate. The world goes bonkers. The first four winners hail from all over the world, but all are varying degrees of spoiled brat; poor Charlie doesn’t seem to stand a chance, but then (in a wonderful sequence) he finds some money under a storm grate, buys two Wonka bars, and discovers that hard-sought flash of gold underneath. Some of the first-act comic vignettes are desperately unfunny; the worldwide search for the tickets yields a couple of chuckles (and seems to predict the Cabbage Patch Kids and Tickle Me Elmo bloodbaths of later years), but the filmmakers appear to be biding their time, and repeat viewers will be impatient for the movie to get to the damned factory already. The Oompa-loompas have become fairly beloved figures in pop culture, so we tend to forget the fact that they are, for all intents and purposes, slaves (a fact made much clearer by the original descriptions and illustrations in Roald Dahl’s novel); the implications leave quite a few unanswered questions. And the music is hit and miss; as joyful as “(I’ve Got a) Golden Ticket” is, and as memorable (for better or worse) as “Oompa Loompa, Doompa-Dee-Do” may be, is there anyone who couldn’t do without the treacly “Cheer Up, Charlie”? Those are the sum total of my critiques; this more critically-minded viewing yielded, for this writer, more clues as to what the picture does right. First and foremost, I’d never really appreciated the tremendous charisma of Ostrum, and how vitally important our sympathy for him was to the film overall. But his is a beautifully modulated piece of work, sweet without being cloying, and he shows admirable restraint in his delivery of potentially maudlin lines like “You know, I’ll bet those golden tickets make the chocolate taste terrible.” He’s surrounded by a gallery of immortal characters; shrieking rich girl Veruca Salt (“Daddy, I want an Ooompa-loompa now!”), gum-chewing Violet Beauregarde, crass little Mike Teeveee. But the gifted character actors playing their parents have never really gotten their due; the great Roy Kinnear (veteran of countless Richard Lester pictures) is perfectly cast as the smugly put-upon Mr. Salt, while Dodo Denney exhibits near-perfect comic timing as Mrs. Teevee. But from his entrance (nearly 45 minutes in), Gene Wilder owns the picture; it is his most iconic role (yes, even more than young Dr. Frankenstein), a performance of real depth and genuine comic invention. He’s funny on several levels (his dryly half-hearted attempts to stop the bad kids from meeting their doom; the wide-eyed enthusiasm of his line, “the suspense is terrible… I hope it’ll last”; his good-natured assurance, “I think that furnace is only lit every other day, so they have a good sporting chance, haven't they?”), and his timing is so good, he can even sell a third-rate joke like throwing a shoe into a candy mix because it “gives it a little kick.” But there’s nuance to his work; that trippy, terrifying boat ride is made infinitely creepier by his sinister line readings, and when he takes a dark turn and unleashes on Charlie and Grandpa Joe at the journey’s end, Wilder doesn’t pull any punches. It is a fabulous turn, and a strong anchor for this uncommonly rich and satisfying family film. 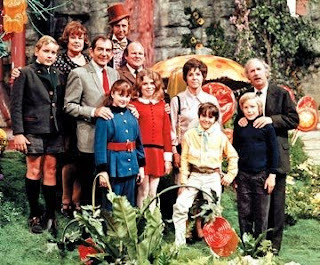 Willy Wonka & the Chocolate Factory is a modern classic, and deservedly so; its clever construction, fairy tale sense of fair play, and wicked humor not only stand the test of time, but stand up to multiple viewings. The hipsters can have Tim Burton’s blasphemous 2005 remake; this one is the genuine article. "Willy Wonka" made its Blu-ray debut on Tuesday, October 6th. On DVD: "Nick Swardson: Seriously, Who Farted?" On DVD: "How I Met Your Mother: Season 4"
On DVD: "A Muppets Christmas: Letters to Santa"